ST. LOUIS (AP) — The spotlight was downright searing when Jordan Spieth arrived at Quail Hallow last summer, fresh off a victory at Royal Birkdale that had put him on the precipice of the career Grand Slam. He didn’t wilt. Didn’t even wither. Spieth just didn’t win, putting together four consistent-if-unspectacular rounds that left him tied for 28th, well behind good buddy Justin Thomas. It was a good PGA Championship for a player that had come to expect greatness or at least have greatness expected of him. But it also meant an entire year waiting for another shot at the Slam. That noise? It’s softened considerably during the last year, and the spotlight that accompanied him to Quail Hallow shines a little less brightly on Spieth in St. Louis. He’s yet to win since Royal Birkdale, the missed cuts becoming too frequent for comfort. He looked as if he might be turning the corner at the British Open last month when he shot 65 on Saturday to surge into contention, but a birdie-less Sunday and final-round 76 dropped him to the wayside. He followed that with three rounds in the 70s at the Bridgestone Invitational last week, leaving him a full 20 shots off the pace — and outside the top 20 for the eighth consecutive event. 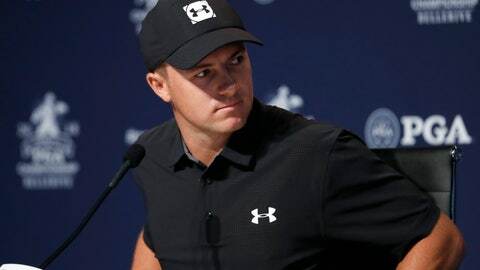 The 25-year-old Spieth has only taken that one crack at joining Gene Sarazen, Ben Hogan, Jack Nicklaus, Gary Player and Tiger Woods in completing the modern Grand Slam. But history suggests that if he doesn’t lift the Wannamaker Trophy soon, Spieth might never accomplish the feat. Nicklaus needed just three tries after winning the PGA in ’63 to win his first British Open, and Player likewise needed three tries after the ’65 U.S. Open to win his first British. Woods needed about a month between the U.S. Open and British Open in 2000, then added the PGA a few weeks later and the Masters the following year to hold all four majors at the same time. He certainly didn’t have to endure the questions that followed Arnold Palmer, who tried for more than three decades to finish the Slam at the PGA, or Tom Watson, or spent 24 years chasing it. Or the questions that have started to follow Rory McIlroy, who needs to win the Masters, and Phil Mickelson, who has played the U.S. Open five times without capturing the only major he’s missing. If nothing else, Spieth should have plenty of support this week. His beloved grandfather, Bob Julius, and most of his mother’s side of the family was raised in the St. Louis area. And while Gramps has been there for many of his career-defining moments, there are many distant relatives that will get to see him compete for the first time this week. It would be even more fun to make history in front of them. “I’m sure Jordan feels a little bit different this week than he does the other three majors, but that’s normal,” McIlroy said. “It’s a big deal, but I think, once you get out on the golf course and you start the tournament, all you’re thinking about is trying to shoot good scores and hit good golf shots.